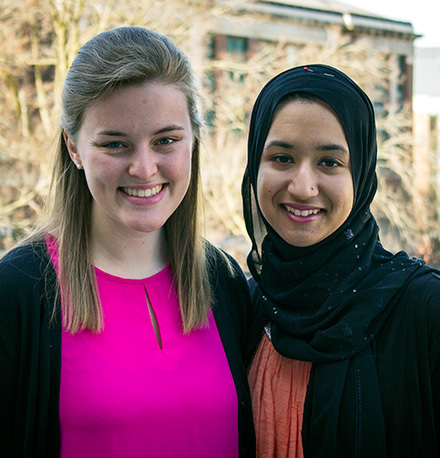 ESF seniors Margaret Foley and Fareya Zubair have been honored with the SUNY Chancellor's Award for Student Excellence. The award is the highest honor bestowed upon students by the State University of New York. Both Foley and Zubair will graduate from ESF in May. Together, they will serve as class marshals during Commencement ceremonies May 14. Foley, an environmental and forest biology major from Fredonia, New York, was described in the awards program as "a bright and extremely hard-working student who possesses a seriousness of professional purpose, a passion for the study of environmental biology and rare leadership skills." She was cited for serving "her fellow students and the entire college with vision and determination." Foley has been a member of the Undergraduate Student Association (USA) since her first year at ESF. She served as first-year class senator and USA director of campus life before taking on the role of president this year. She has been a resident assistant since her sophomore year and serves as an undergraduate teaching assistant for dendrology and biology laboratories. She was the recipient of the ESF Alumni Association Memorial Scholarship and the Phyllis Roskins Award for the Department of Environmental and Forest Biology's (EFB) Outstanding Female, and a participant in the ESF Honors Program. She is a member of Alpha Xi Sigma. In addition, Foley served as student representative on the ESF College Foundation Board of Directors and the ESF Alumni Association Board of Directors, and as a member of the SUNY Student Assembly. She serves on the ESF Strategic Planning Steering Committee and is an ESF Student Ambassador. Her community service includes volunteering with the Free Bread Program, Canadaway Creek Conservation Project, Page Wildlife Center, Carpenter's Brook Fish Hatchery, Adopt-A-Stream, Cornell Cooperative Extension, Syracuse Inner City Hoops for Peace, Lake Street Elementary School and Fredonia Middle School's backpacking program. She has worked as an intern with Baltimore Woods Nature Center, Jamestown Audubon Nature Center and Friends of Recreation, Conservation and Environmental Stewardship. Zubair, a biotechnology major from Manlius, New York, was described as "a hardworking student dedicated to making a change in the lives of youth and her peers." Zubair served as a research assistant on ESF's American Chestnut Research and Restoration Project and has been a teaching assistant in a statistics class. She tutors students in chemistry at a community college. She has been an active member of the Undergraduate Student Association, serving as junior and senior class senator before holding her current position of director of student affairs and diversity. She also served on the planning committees for Earth Week and the annual December Soiree. Zubair has also been a committee member for the ESF Red Cross Blood Drive and is a founding member of "Unearthed," ESF's environmental literary journal. Her community service includes serving as co-founder and program assistant for Empathy Matters at Syracuse University, an academic associate research volunteer at Upstate Medical University, head judge for the Science Olympiad and a volunteer with the Milton J. Rubenstein Museum of Science and Technology. In addition, she was a program assistant with Science Horizon, an assistant instructor with Kumon and an employee with Lune Chocolat. The Chancellor's Award for Student Excellence acknowledges students who have received recognition for distinguished achievements. This year, 248 students from 64 campuses received the award. Nominations are sought for students who have best demonstrated and been recognized for their integration of academic excellence with other aspects of their lives including leadership, campus involvement, community service, arts (creative or performing), athletics and/or career achievement. Student from Italy Finds Motivation at ESF"Here I am constantly pushed to do more"
Ryan HenrySU's biggest sports fan.